Buying new tires for your vehicle is almost never a fun experience, but a guide to the best rated car tires may take a little of the sting out of the process. When selecting the best, make sure you take into account what you need. Do you need all-season tires or tires just for driving in wet and dry conditions, but never snow? Do you prefer to pay more for a brand you've heard more about through the years or will a budget option from a lesser-known brand work for you? You'll also want to look at tread life, braking, how they handle, and how often they hydroplane in selecting which of the best rated car tires is right for you. These are the Best All-Season Tires according to Consumer Search. They offer great traction on wet and dry pavement, and even grip well when presented with snow and ice. Owners report a good tread life and say that the high price is worth it. These come with an 80,000 mile warranty. This tire has a long history of being highly recommended. These were voted the Best Budget All-Season Tires by Consumer Search. These are listed in the number two position because they compare to the highly recommended Goodyear Assurance TripleTred, performing just as well in all tests and even better on snow and ice. They come with a 100,000 mile warranty. The government treadwear rating for the Hancook tire is 40 points lower than the Goodyear tire, but still very high (700). Tire Rack ranks this tire second after the Goodyear Assurance TripleTred for its good ride quality and low tread noise. They do point out that it is lacking in the wet traction and road handling departments, but it still outranks most other tires in the passenger all-season category. The warranty is six years/80,000 miles. This tire was named the third best ranked car tire by Tire Rack, and while it could improve on the noise and comfort of the ride a bit, the wet and dry traction and ease of handling made it a top pick. The treadlife warranty is six years/90,000 miles. 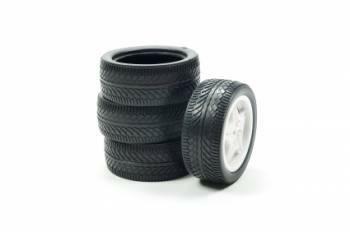 According to reviewers at 1010 Tires, this tire designed for SCCA racing gets 4.1 out of 5 stars. There are only five reviews, but the ratings are positive, with excellent marks in dry and wet traction, handling, comfort, noise and treadwear. This is a summer tire, so it performs best in dry and wet conditions, but not snow. This winter tire scored 3.6 on a 5.0 scale based on 90 customer reviews. Traction is superb in icy or snowy conditions, and the tires handle well in dry and wet conditions, too. The lowest mark it got was in the treadwear category, where it scored just a 3.1. This tire is also a good choice for budget-conscious buyers and has a five-year warranty.